Hope y'all are having a wonderful week so far! I've been enjoying a nice, slow start since Sunday. Just catching up on the to do list, and spending my evenings watching what's on the DVR. I'm actually really loving the rest and relaxation. I've been making dinner at home each night, and getting a lot of stuff done around the apartment. While it doesn't sound all that "fun," the rest has been much needed. Let's talk about this outfit though shall we? 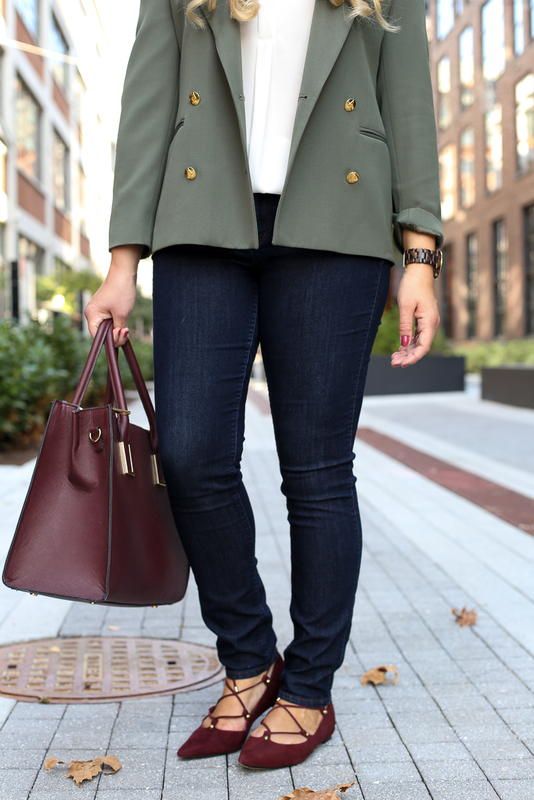 One of my favorite color combos for fall is olive green and a burgundy Bordeaux. I think they just mix so well! I do like to brighten the two colors up though by pairing with a cream or ivory. A good neutral piece can help break up the two darker colors. A friend gifted me this blazer, so I apologize that I can't link to the exact one. But I did find a really good alternative linked above. Personally, I love the shape and structure of a J.Crew or Banana Republic outer piece. So you can definitely check out their options as well. 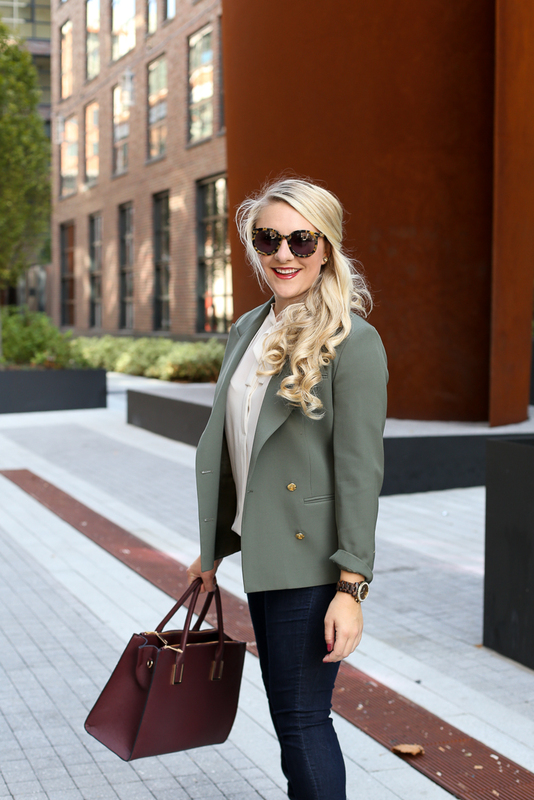 I wear blazers with pants to work all fall and winter long, as well as with jeans and boots, or in this case lace up flats! All this combined, makes for a casual fall outfit perfect for an afternoon of running errands or a casual Friday at the office. 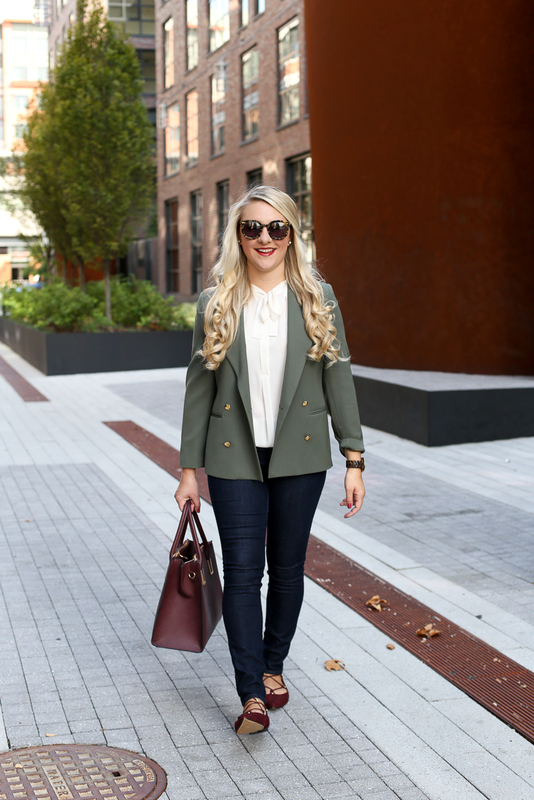 Too funny I have the same color combo on my blog today! I LOVE those lace up flats! That really is Catherine!! Love how you styled the color combo too! Isn't it just amazing?! I'm going to be wearing the two colors all fall long, ha! If I could wear flats I'd totally pick those! I love this color combo! Fall's my favorite for fashion! It's my favorite for fall!! Glad you enjoy it as well! Love these colors together and those flats are amazing! Thanks Alissa!! The flats are super comfortable and come in several colors too!